This story is part of a major investigation by American news organizations ProPublica and Frontline. In 1996, Firestone, one of the world’s largest tire-makers, was locked in a grueling labor dispute with the United Steelworkers of America. The union portrayed it as a struggle between blue-collar workers and a company that was aiming to slash the pay and benefits of its employees. Thousands of workers went on strike, and the union mounted a consumer boycott of Firestone products and those of its Japanese-owned corporate parent, Bridgestone. There were protest demonstrations, too, including a “black flag” motorcycle brigade at the nation’s most famous auto race, the Indianapolis 500. The steelworkers 2013 who had begun representing Firestone employees after a merger with another union, the United Rubber Workers, in 1995 2013 also began looking into the company’s activities abroad, most notably its rubber operations in Liberia. 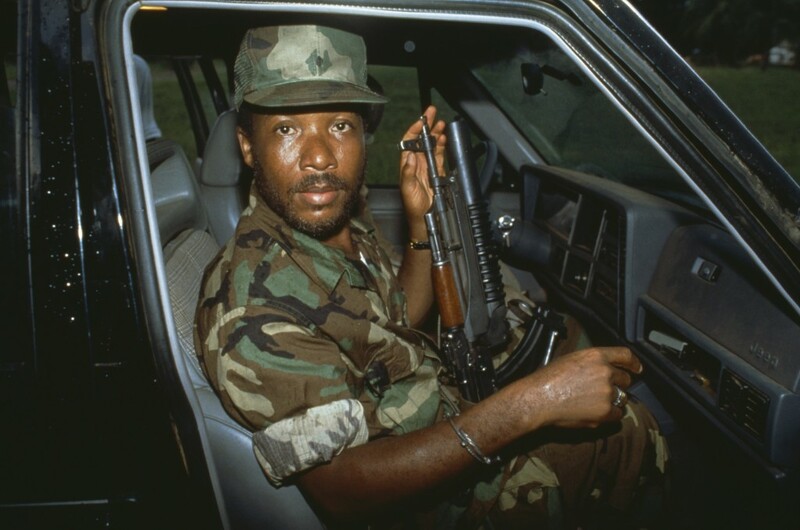 With the help of private investigators, the union uncovered evidence that in the early 1990’s Firestone had been the source of money and logistical support for Charles Taylor, the notorious Liberian warlord whose violent bid for power had ensnared the country in a horrific civil war. The union then developed plans to use what it believed might have been criminal conduct by Firestone as leverage in the contract negotiations. Plans were hatched to hold press conferences. A secret briefing was prepared for Vice President Al Gore. Importantly, there were also discussions about using the evidence of dealings with Taylor to demand that Firestone permit the steelworkers to play an active role in monitoring labor standards in Liberia. The union’s documents from the time suggest it saw a greater good in revealing Firestone’s history with Taylor 2014 that doing so might make the company “accountable to the Liberian people and to the world,” as the union stated in the introduction of the 43-page confidential report detailing their findings. But the steelworkers union never made its findings public. Instead, it buried the investigation of Firestone’s role in the Liberian civil war, and the company’s actions remained secret for more than 20 years. What happened to the investigation is not clear. But just two weeks after the union completed its inquiry, Firestone and the steelworkers met in confidential negotiations, and soon reached a deal. The union won concessions on pay and benefits. But any formal notion of improving working conditions in Liberia was abandoned, and Firestone’s dealing with Taylor would not be aired until a ProPublica and PBS Frontline investigation late last year. The steelworkers would not comment at all 2014 on their investigation into Firestone’s activities in Liberia, what role the investigation had played in the negotiations, or why the union had decided to keep the information secret. In an email, Wayne Ranick, a spokesman for the steelworkers, said the union could not comment on the matter because key leaders from that time period, including the union president and general counsel, are now dead. Other figures involved in the investigation had retired, he said. Joe Uehlein, a longtime labor activist who served on the steelworkers’ global campaign strategy team, said Bridgestone Firestone was well aware of the union’s investigation and that it had helped prompt the eventual deal. The Liberia investigation “played a big role in bringing Bridgestone Firestone back to the negotiating table,” said Uehlein, who is now retired. Last November, ProPublica and PBS Frontline detailed for the first time the role Firestone played in the early stages of Taylor’s bloody rise to power, a set of findings that in several key respects echoed the evidence the union’s investigators had uncovered decades earlier. The ProPublica and PBS Frontline story drew on hundreds of interviews, copies of documents found in court records, once-secret diplomatic cables, trial transcripts and work done by Liberia’s Truth and Reconciliation Commission. Firestone, whose Liberian rubber plantation was regarded as the largest in the world, signed a formal deal with Taylor in 1992, agreeing to pay the warlord millions in exchange for being able to operate in the country during the early, brutally violent years of its civil war. Taylor, who later was convicted of war crimes for atrocities carried out in Sierra Leone, testified under oath during his trial at The Hague that Firestone’s money and cooperation had been critical to his insurrection. Firestone maintains that it dealt with Taylor only under threat of violence and in order to preserve its investment and provide for thousands of its Liberian workers. It insists the company broke no laws, and that Liberia to this day benefits from its presence in Liberia. Liberia has long been exploited for its rich natural resources and its occasional geopolitical usefulness 2013 by its own leaders, as well as by foreign powers and global businesses. The country’s historians have argued that the interests of the Liberian people have routinely lost out to the political or business deal of the moment. To Edwin B. Cisco, news of the union’s 1996 decision to make peace with Firestone and stay quiet about the company’s dealings in Liberia carries a familiar sting. Cisco, the vice president of the union that represents employees on the company’s rubber plantation outside the capital city of Monrovia, said he wished the steelworkers had made their findings about Firestone and Taylor public in order to hold the company accountable for its actions. Cisco, though, was reluctant to criticize the American union too harshly, noting that he and his workers have received extensive training and support from the steelworkers over the last decade. And, as a union boss himself, he recognized the obligations the steelworkers had to their American members during the 1996 standoff. ProPublica was given access to the union’s boxes of Liberian material by a person who thought the union erred in not releasing the information at the time to help Liberian workers, and believes that Firestone still needs to improve its treatment of workers. The boxes contained a formal investigative report, videos of scenes from the Firestone plantation, and internal union memos and correspondence. ProPublica disclosed the nature of the material to the steelworkers and Firestone in seeking explanations for the events of 1996. The labor showdown between Firestone and its workers traced its roots to 1994, when Bridgestone, through its American subsidiary, Firestone, along with several other foreign tire companies, began demanding substantial wage and benefit concessions from American rubber workers. In the summer of 1994, thousands of American rubber workers walked off the job at Firestone factories in five states. Numerous bargaining sessions were held, but the environment only worsened. Permanent replacement workers were hired by Firestone. Unfair labor practice complaints were filed by both sides. The protracted strike depleted the treasury of the United Rubber Workers, which represented the Firestone workers, and in 1995 the union was forced to merge with the United Steelworkers of America. Once the steelworkers came on board, leaders assembled a strategy team to identify potential vulnerabilities for Bridgestone Firestone. Then union president George Becker later described his game plan to academic researchers. Through the spring and summer of 1996, investigators with the steelworkers and the James Mintz Group, a private investigation firm, began gathering evidence of Firestone’s relationship with Taylor. Investigators conducted interviews with former U.S. diplomats, academics, journalists and Liberian government officials, obtaining thousands of pages of documents. Taylor, a onetime member of the government of Liberian President Samuel K. Doe, had launched a bid to topple Doe’s regime in 1990. He assembled a rag tag army, one populated by child soldiers who became infamous for their atrocities and efforts at the ethnic cleansing of certain tribes in Liberia. Taylor gained control of much of the country, and declared himself the de facto president. But he was not formally recognized by the United States, and the American State Department, among other agencies, chronicled his human rights abuses. The documents the union turned up showed Firestone officials had initially embraced the idea that Taylor and his men were “freedom fighters,” not terrorist rebels. The union’s investigators asserted they had found evidence that Firestone had used humanitarian aid as a means to gain commercial advantages in Liberia from Taylor’s rebels. And the investigators also obtained a “memorandum of understanding” between Firestone and Taylor’s guerilla organization in which the company agreed to use Taylor’s fighters to safeguard the company’s assets on the plantation. The investigators, in their reports to the union, noted that the company had never spoken publicly about the agreement with Taylor. The union also claimed to have obtained credible proof that a Firestone comptroller had wired $230,000 to a Taylor rebel bank account in Geneva, Switzerland, on Nov. 22, 1992, shortly after Taylor’s forces launched Operation Octopus, a surprise attack on Monrovia that plunged the country into years of additional conflict. The records show that investigators also purchased video footage that they intended to circulate as part of their evidence of Firestone’s dealings with Taylor. One clip appears to show a relaxed Taylor and his rebels on the Firestone rubber plantation in the early days of the 1992 assault on Monrovia. Another clip shows a member of a West African peacekeeping force showing journalists evidence of a mass grave of alleged victims of Taylor’s army, a grave located on the Firestone plantation. “[Bridgestone Firestone], in its rush to resume operations of its plantation, ignored the consequences of its collaboration with Taylor, which led to slaughter of its workers, their families and other civilians on the plantation,” Jerry Fernandez, the union’s head of corporate campaigns and the director of the 10-month investigation of Firestone, wrote in an Oct. 14, 1996 memo. The documents reviewed by ProPublica make clear the union was confident that the material would influence negotiations. Fernandez suggested the steelworkers prepare a “hard-hitting, professionally done, pamphlet” for public distribution, laying out the evidence of Bridgestone Firestone’s complicity in prolonging the Liberian civil war and urging American consumers and retailers to stop using rubber products that, “are made a by company that, literally, has blood on its hands,” Fernandez wrote. Fernandez did not respond to requests for comment. On Oct. 30, 1996, the union’s corporate campaign department prepared a document that briefly explained the key findings from their investigation into the company’s actions in Liberia during the civil war to present to Vice President Al Gore, who was visiting the Steelworkers headquarters in Pittsburgh. It is unclear whether Gore ever received the documents. Efforts to speak to Gore were not successful. The next day, Oct. 31, the steelworkers entered into secret talks with Bridgestone Firestone. Soon, a deal was done, and then announced. As part of the agreement, the company agreed to rehire all workers dismissed during the strike and to give employees their first across-the-board raises since 1982 as well as partial back pay. In exchange, the union agreed to end the strike and its highly visible negative campaign against the company. On the day of the announcement, Becker, the union president, called it a “historic day for the union and the entire labor movement,” according to news reports at the time. For Firestone’s Liberian workforce, the new accord would do nothing to help address their own grievances against the company, which included demands for better wages and back pay. In September of 1997, less than a month after Taylor became president of Liberia, Firestone workers launched a strike on the rubber plantation. Taylor responded in typically harsh fashion, sending in police to quash the demonstration. According to the Associated Press, the police opened fire on the protestors and several strikers were killed. Today, Bridgestone remains one of the largest manufacturers of tires and rubber products in the world. The company has, by and large, been able to avoid strikes in factories across the U.S. in recent years. In Liberia, Firestone remains the largest taxpayer and private employer in Liberia. The company says that it offers some of the best wages and benefits in the region to the company’s employees and their families, including free housing, subsidized food, paid time off and a pension. The company says that since 2004, it has injected more than $1 billion into the Liberian economy. Firestone also recently revamped the Firestone Natural Rubber website, a kind of online history of the company that was largely silent on its role in the Liberian civil war. The site now includes a detailed defense of the company’s actions. In May 2013, the Firestone Agricultural Workers Union of Liberia and management signed to a three-year collective bargaining agreement. The contract expires at the end of the year. Cisco commended Firestone management for addressing some of workers’ concerns regarding wages, benefits, and living conditions. Still, Cisco said, many Firestone rubber workers to this day find themselves forced to enlist family members to complete their daily workload on the plantation. He said union leaders intend to make that one of the issues in the next round of negotiations. Help ProPublica investigate: If you have experience with or information about the United Steelworkers of America campaign or the Firestone companies dealings in Liberia, email t.christian.miller@propublica.org. Related stories: For more coverage, read ProPublica’s previous reporting on Firestone, Charles Taylor and Liberia’s civil war. ProPublica is a Pulitzer Prize-winning investigative newsroom. Sign up for their newsletter.